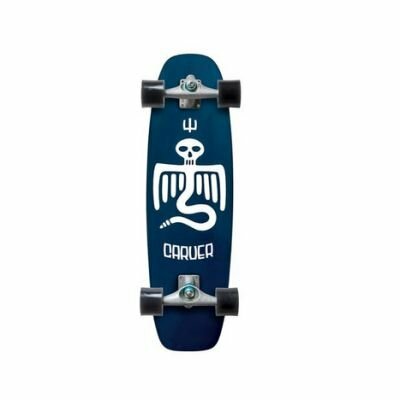 Shop Home > Skateboards > Carver Point Break C7 33.75"
Carver Point Break C7 33.75"
This item is not available for purchase online. Please call 415-524-8492 to order. In stock but Carver does not allow online sales. When the director of the new Point Break approached us, he told us he wanted to work with a performance-oriented company to make the board that would not only be featured in the story of the film, but also ridden by the stunt riders for the skateboarding action scenes. We were stoked to be a part of the project so we worked directly with the stunt crew as they began rehearsing the scenes, which involved surfskating down a spiraling parking garage ramp, dodging cars and going fast. They needed a combination of control at higher speeds while maintaining tight maneuverability and quick response. We sent them various sizes and configurations until we arrived at the best proportions. 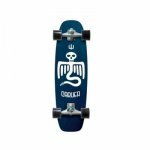 At 33 ¾” this board is not very long, but the 19” wheelbase smoothes out the ride for higher speeds, while the chopped off nose gives you a nice wide platform for your front foot for extra carving control. It was a combination that worked perfectly for the demanding requirements of a professional stunt crew, and we thought it would be something our riders would appreciate, too.